Merritt-Pop Popcorn started out in 1984 as an idea and has evolved into a family-run business spanning three generations. Over the years Merritt-Pop has been featured at Dollywood in Pigeon Forge, TN, Neyland Stadium in Knoxville, home of the Tennessee Volunteers, and at Fulton County Stadium, home of the Atlanta Braves. Merritt Popcorn Company is a Tennessee corporation and we are an active participant in the Tennessee Department of Agriculture's Pick Tennessee Products program. 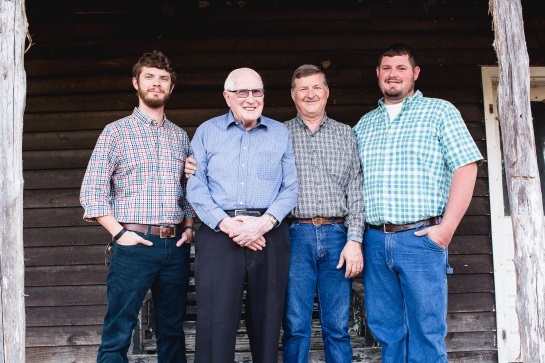 John Merritt ("Buddy" to his friends and "Pappy" to his family) worked in sales for Nabisco for more than 30 years and was very familiar with foodservice distribution. Popcorn production was another matter. John's youngest son, Mike, owned & operated M&M Farm Supply in Pulaski, TN for many years. Most of the local farmers traded at the store. In '84, one of those farmers offered Mike several thousand pounds of shelled popcorn - excess from a contract - at a bargain price. Mike knew he could blend the popcorn & sell it as livestock feed at the farm store, but he called John first: "See if any of your foodservice customers want to buy this popcorn before it goes to the feed mill". Within a few days, John sold all the popcorn and Merritt-Pop was in business. He partnered with a local farm to grow popcorn on contract, and soon took retirement from Nabisco to run Merritt-Pop full time. "Grown in the Tennessee Valley," Merritt-Pop's slogan, is a fact and John bought everything possible locally. The popcorn is grown on different farms, sometimes on the Merritt farm and some years on contract by other local farmers. In 2010, Mike's two sons Michael and David became the third generation of Merritts to be involved with the company. John, then in his early 80s, decided to retire "again", so on January 1, 2010, Michael and David took over as co-owners. In 2014, we celebrated 30 years in business. We are most proud of the fact that we still sell our popcorn to some of our original customers - Reinhart (formerly The IJ Company, Knoxville), US Foodservice (formerly King's Foodservice, Knoxville), IWC Food Service (Cookeville), THS Foodservice (Chattanooga) & Briggs, Inc. (Corinth, MS) have been valued partners and distributors for our entire existence (in fact, all were John's Nabisco clients as well). John M. "Buddy" Merritt passed on 12/24/2017 but his legacy lives on.